The comfortable weather, perfect location with mountains and oceans around and multi-culture are the impression that people usually have for LA. And the restaurant that we wanna introduce today presents the idea of multi-culture perfectly. The restaurant is in an old European style castle building. The building was designed as an office by the famous comic actor Charlie Chaplin. They transformed the old building into a popular spot that people love to take photos and check in at. And the food they serve is mainly French but also have some Korean and American touch. This restaurant is not only a good spot for photos but also a place that can satisfy your hungry tummy. I guess that’s the reason why they get such high rankings on Yelp, TripAdvisor and Google. Even the restaurant has opened since a while, but it’s still on the must-go list in LA for many people. Once there are some friends visiting LA, I will recommend them this place. So they can enjoy the sunshine and amazing food in LA. Let’s get ready and see what we had with my employees in this restaurant! First thing first! I wanna introduce my personal favorite, Kimchi Fried Rice. 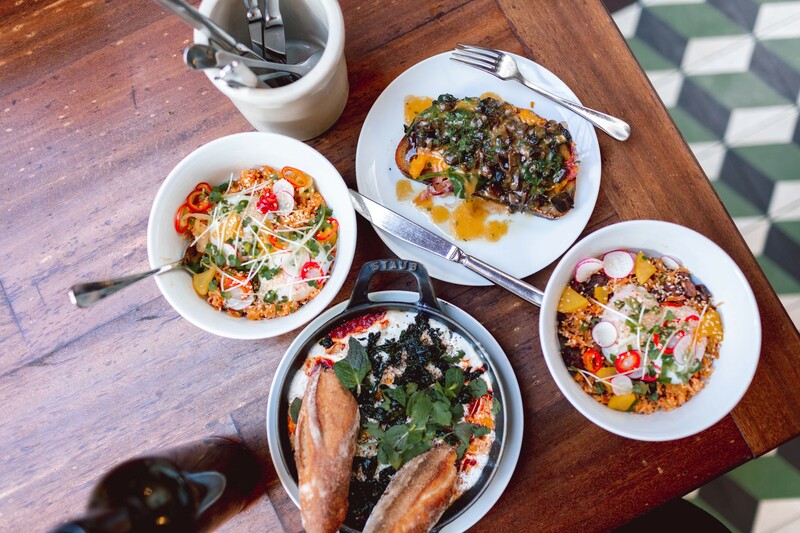 You might get a bit frustrated with having Korean dish in a French restaurant. But if you ever have a look at the reviews and comments about République, you must notice that this is a dish that you can not miss out! Their special recipe came from the traditional kimchi bibimbap. 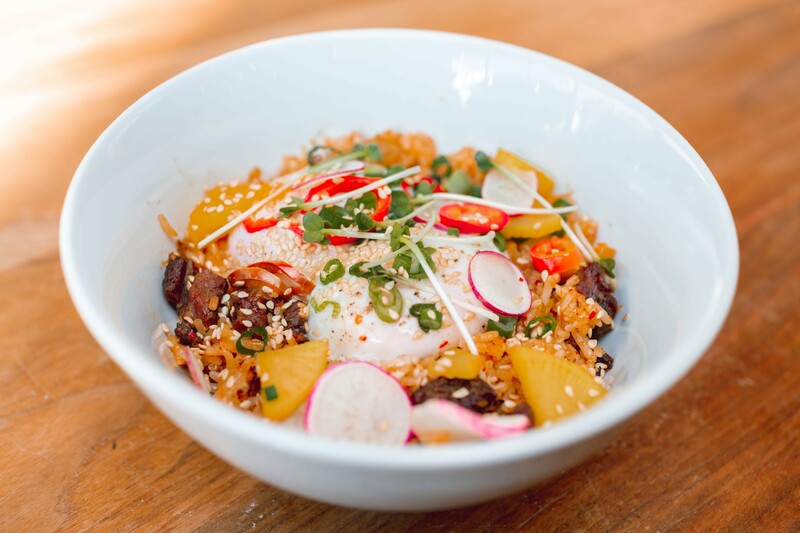 You will get a full bowl of beef and kimchi fried rice topped with some pickled radish, rockets, sesame seeds, shallots, and two perfect soft poached eggs. It’s a visual and olfactory delight. It’s making me hungry while I’m thinking about it! I love the way they cook it. It’s healthy and delicious. It is definitely a must-eat for me every time I come. The ingredients of this toastie look very simple. But once you take a bite, you know that it’s not just simple! Each ingredient tastes amazing as it is, and they make a great combination altogether. No doubt that it is one of the most popular dishes here! 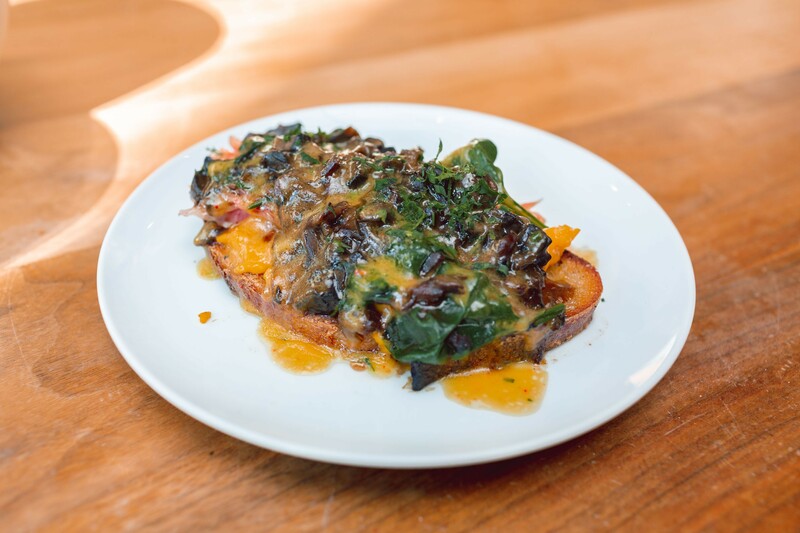 The cooked mushrooms on the very top of the toast are so tasty. If you are a fan of mushrooms, you will love it! And the house-cured ham is perfect smokey. It doesn’t make the whole dish taste only like ham. The salty taste of ham and mushrooms make a perfect match. And the scrambled eggs bring the dish up to another level. This toastie will make you take one bite after another. It’s the taste that you can never get enough! 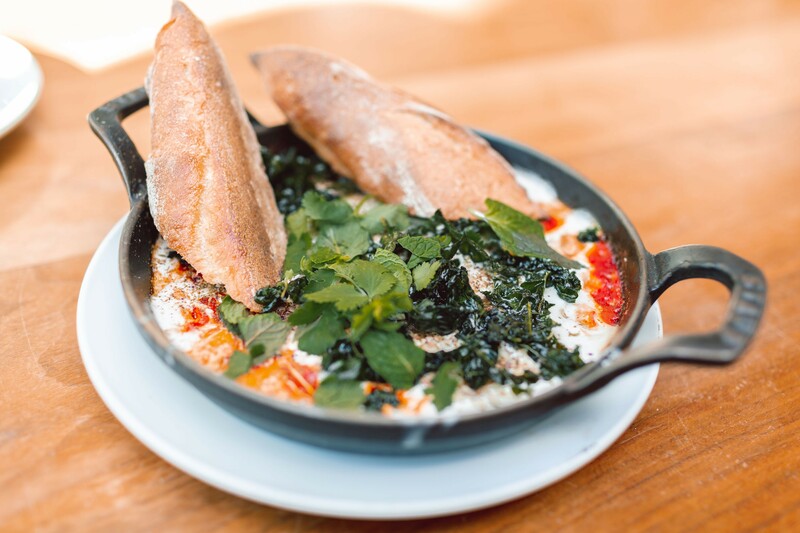 This dish is a new version of the traditional Tunisian shakshuka. When the waiter recommended this dish to us, I was not expecting something special like this. And it came out to be to one of the most impressive dishes that I had. The main ingredients of shakshuka are tomatoes and peppers, but the sauce is the soul. The sauce is cooked with yogurt, tomatoes, hummus, and mixed with eggs yolks. It surprised me so much just by trying only the sauce. The best way to enjoy a dish with tasty sauce is to dip it with bread. French baguette contains low sugar, low salt, and low fat. And it’s toasted with crispy skin and soft inside. The bread can absorb a great amount of sauce. I guess it’s the best way to enjoy this dish! Many bloggers from all around the world came to this restaurant to enjoy the food and the great atmosphere. I was wearing the exotic Colored Ruffle Knit Skirt and Drape Lantern Sleeves Top. 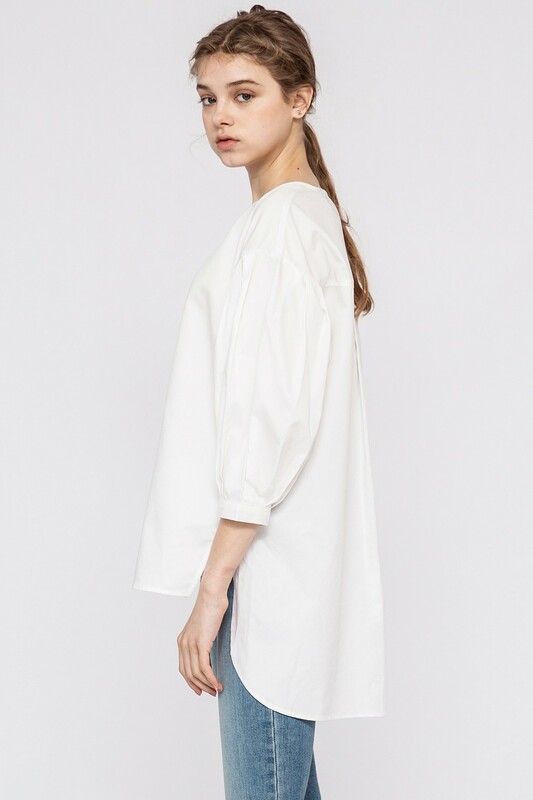 The outfit is not complicated but with some fine details. It’s very easy to blend in the place. République is one of the most instagrammable places in LA. If you have a chance to visit, don’t forget to take some photos while enjoying the awesome food!